The 2016 PBA Commissioner’s Cup elims is winding up, and a couple of games with dire playoff repercussions were played last night. Star beat Mahindra to capture the last bus to the quarterfinals even as Ginebra blasted Meralco to remain in contention for a #2 spot. The Star Hotshots grabbed the final quarterfinal berth in the Oppo PBA Commissioner’s Cup after knocking out Mahindra with an 86-73 victory on Wednesday at the SMART-Araneta Colseum. Import Ricardo Ratliffe posted 24 points and 16 big rebounds while Mark Cruz stepped up in a big way, rattling off 18 points from off the bench, including three three-pointers in the fourth quarter. Ian Sangalang scored 12 points, while Allein Maliksi chipped in with 11 markers. With the win, the Hotshots finished their elimination round campaign with a 5-6 record, closing the door on the Enforcer (4-7). Augustus Gilchrist, Karl Dehesa, and Aldrech Ramos each tallied 13 points for the Enforcers in the loss. The Barangay Ginebra San Miguel Kings put together an impressive performance against league-leading Meralco as they whipped the Bolts, 103-90, to keep their hopes of clinching the twice-to-beat advantage for the Oppo PBA Commissioner’s Cup quarterfinals alive on Wednesday at the SMART-Araneta Coliseum. Ginebra led by as many 22 points and their defense shut down Meralco import Arinze Onuaku as they finished their elimination round campaign at 7-4. That means the Kings still have a chance to finish in the top two, if the San Miguel Beermen (7-3) lose to Tropang TNT (6-4) and Alaska (6-4) drops their final assignment to NLEX. Greg Slaughter led the way with 21 points on 7-for-9 (77%) shooting from the field. 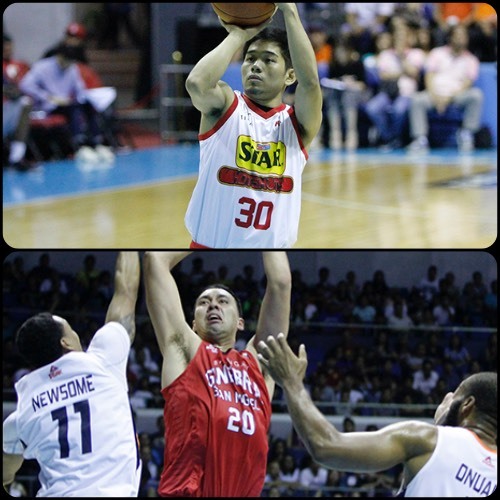 LA Tenorio also had a big night, logging 20 points for Ginebra. Mark Caguioa added 16, Japeth Aguilar chipped in with 14, and import Othyus Jeffers came close to notching a triple-double, finishing with 11 points, 15 rebounds, and 9 assists. They also frustrated Onuaku, who was held down to two points in the first half, taking only one field goal attempt over the first two periods. He fouled out of the game with only 10 points, though he did have 16 rebounds in the contest. Meralco, which had previously clinched one of the twice-to-beat incentives, will head into the playoffs with an 8-3 mark.